Catch is a new fun and free touch puzzle game on the Windows Phone Store. Catch is an addictive Touch Puzzle Game. You have to catch all colored stars spread across many levels. To play, link all stars of the same color with your finger. In each puzzle, a path appears when you connect the stars of the same color. The paths must not be crossed, along a bridge except. Game is easy with two stars (level 1). But, it become harder when the number of stars rise. 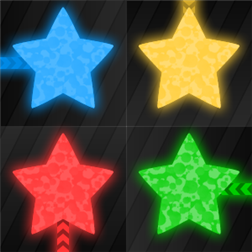 The game becomes a real challenge when the levels includes more than 20 stars in 6 different colors. Catch has 160 levels. Play for free to the 40 first levels. Then, Play more levels by buying two packs of levels: Master Pack that contains 60 hard levels, and Elite Pack that contains 60 hardest levels. Catch game has a colorblind mode. Tile of the game indicate your progress. The game ask you to pin it to start screen at first launch. Written by: Hyde13 on December 10, 2013.